Inlays on the fingerboard mark noting positions. 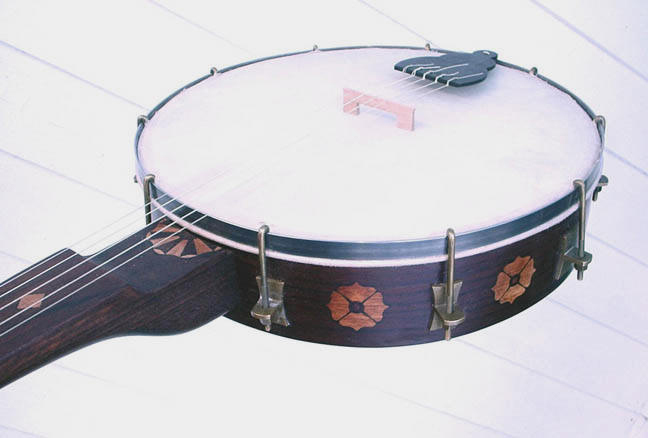 The circle near the fifth string tuner marks the seventh position and the octave position is located at the point between the two bumps on the side of the neck. Brass geared tuners. A 13.5" rim with a 30" scale length. Neck is solid rosewood and The rim is bent oak with rosewood veneer. The hooks and brackets are brass with a steel tension hoop.